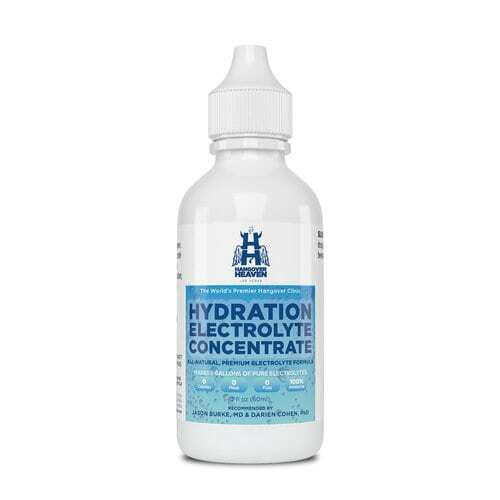 Hydration Electrolyte Concentrate from Hangover Heaven is a doctor formulated liquid electrolyte concentrate uniquely formulated with nutrients and minerals to support hydration, heat tolerance, muscle function, and energy conversion. Contains sodium, potassium, and magnesium. Free shipping in the lower 48 United States. We do not ship to any foreign country due to vitamin import laws. Makes 48 twelve ounce servings! Less than 17 cents per 12 ounces of beverage! HEC is made in the USA and is ideal for health minded people and consists of all-natural ingredients, without any artificial preservatives or calories. Year morning for my husband and I’m tellin you I’ve never seen him recover so quickly nor so completely after an evening of consuming that much alcohol. It was a miracle. I guess I didn’t read the instructions thoroughly and ended up making too much. Either that or he just responded quickly to the ingredients and didn’t really need the rest. But he ended up leaving the remaining mixture on the counter and I felt like even though the price was definitely reasonable and appropriate…. I should drink it so its not wasted. I HAVE NEVER FELT SO GREAT THAT EARLY OR THAT QUICKLY!! Within five minutes I felt like I had had a glass from the fountain of “toddler energy” . I joined my hubs outside and we knocked out so many things that day and felt awesome. The key is probably that it gives you such a huge blast of hydration you body just soaks it up and goes in to overdrive. This stuff is the bomb. I need to check if they sell it by the gallon!! This product essentially turns any drink (or water) into a sports electrolyte beverage. 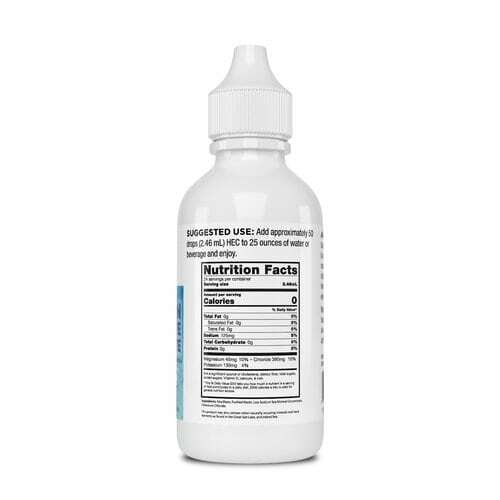 The product itself is simple; add 50 drops to a large drink and it provides rehydrating electrolytes on days you might need them (I tested this on New Year’s Day, just saying). The bottle contains several 50-drop servings so it should save you a lot of money on sports drinks if you typically buy them in stores. It was a tad difficult at first to dispense the drops from the bottle (I would have preferred it was a little squeez-ier) but past that it was rather uncomplicated. The drops themselves taste like very salty water. So far I’m pretty happy with this additive. I live and eat a Keto lifestyle so I’m always looking for ways to add electrolytes into my diet to prevent leg cramps and fatigue. 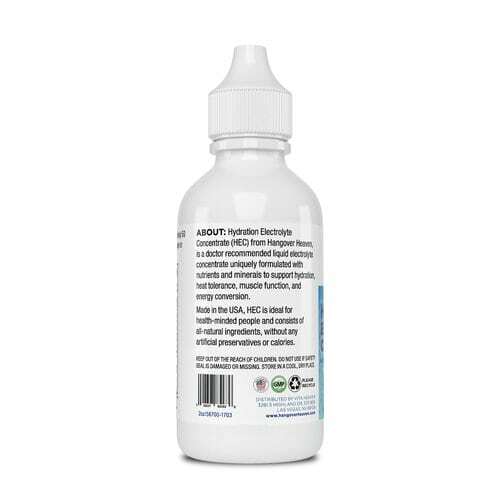 I’ve been adding these drops into both water and coffee, I don’t find that it changes the flavor any. I can tell these are upping my magnesium levels as I haven’t had any leg cramps since starting these. If you are on a Keto or low carb diet these are worth looking into for electrolyte supplementation. I like that there’s nothing extra in it. No artificial colors, sugars, and it’s not an obnoxious flavor (like when I used to try to pre-emptively fight a hangover with pedialyte). You can hardly even taste it. I tried it because my body doesn’t tolerate much alcohol at all anymore, but I will also use it in the future when I’m preparing for a race or tough work out. I’m on a low carb diet and my reaction to alcohol is unpredictable. I have tried this and so far it seems to replenish hydration and mental clarity after an evening of 3-4 cocktails.i am looking forward to seeing how this works after indulging new year’s eve.